The Best Show on Earth, The Ringling Bros. and Barnum & Bailey Circus, will be live at several venues during July. The venues that are hosting the Ringling Bros. Circus this month are: Staples Center in Los Angeles, Reliant Stadium in Houston, Ford Arena in Beaumont, Extraco Events Center in Waco, Citizens Band Arena in Ontario CA and Honda Center in Anaheim. Families looking for something to do with the kids during this hot summer can take them to the circus. Every year there is something new and exciting to see at the Ringling Bros. and Barnum & Bailey Circus. The well known online ticket exchange, Cheap Concert Tickets, is offering exclusive promo code RINGLING for special discounts on circus tickets. Cheap Concert Tickets suggests taking the kids to "The Greatest Show on Earth" - The Ringling Bros. and Barnum & Bailey Circus during the hot summer of 2012. The Ringling Bros. and Barnum & Bailey Circus is an American based circus company which was formed as a merger between a circus company formed by James Anthony and Barnum and Circus also known as Ringling Brothers Circus. After this merger one of the Ringling brothers decided that instead of organizing the circus in portable tents, it should be organized in places like sports stadiums that already have sitting capacity and thus can provide better sitting arrangements to spectators. The history of the circus links back to Dan Castello who was eager to set up his own circus company for which he wanted Barnum to lend not only his name but also financial backing so that the circus could begin without further delay. Barnum agreed with Castello and as a result P.T. Barnum’s “Greatest Show on Earth” was organized. On the other side, Bailey along with James. E. Cooper joined hands to set up a circus business which soon became one of the top rivals of Barnum. This competition was the result of Columbia’s birth which was said to be the first birth of an elephant in the United States. This baby elephant was born to Babe and Mandarin and several people were eager to see Columbia and as a result of this, Bailey’s sales went up. Barnum, after all this, decided to buy Columbia and eventually agreed to arrange a combined show in the late 1880s. Barnum & Bailey Circus shows, as it was named at that time, turned out to be successful as people liked the idea. Jumbo was introduced to the World as the world’s largest elephant and continued giving life to the shows of the circus. Unfortunately, Barnum didn't last long and passed away after which Bailey purchased the circus from Barnum's widow. Afterward, the operations of both circuses were merged into one. After this merger, the circus extended itself beyond the boundaries of the United States and entered into Europe. Five out of the seven Ringling brothers had been in the circus business from the 1880s and at the time when Barnum and Bailey were organizing shows in Europe, Ringling brothers were arranging circuses in various towns by moving in the form of animal drawn caravans. These humble caravans were soon able to move by train which became the source to raise the Ringling Brothers name as the largest amusement enterprise of this era. 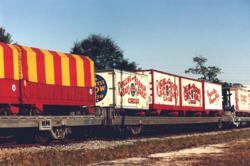 When Barnum & Bailey entered Europe, it propelled the Ringling Brothers to expand themselves to the eastern seaboard. Realizing the fierce competition, Bailey went to the Rockies for the first time to organize a "Super Grand Show." However, Bailey didn’t have the chance to manage circus’s operation any more as he got expired after which company was purchased by Rivaling Brothers. The circus had to pass through several trying times especially in the Great Depression when the economy was quite cruel for every company in the business. John Nicholas who was nephew of the Ringling Brothers proved to be great talent at that time as he successfully managed the company in difficult times as a result of which Ringling Bros. stayed in business. President Roosevelt also provided the Circus special favors to help it out of depression. The train has become the identity of the Ringling Bros and Barnum & Bailey Circus and they currently posses and maintain two circus trains each of which represents two shows of different themes. One is called the Blue Tour Train and other is called the Red Tour Train and both of them are fixed to visit major cities of the world. According to the management of the circus, it’s of utmost importance to give the audience exposure to captive animals because it enables them to make public awareness of animal needs. North American cities and venues which will host The Ringling Bros. and Barnum & Bailey Circus during July and August, 2012 include: Staples Center in Los Angeles CA, Ford Arena in Beaumont TX, Reliant Stadium in Houston TX, Extraco Events Center in Waco TX, Verizon Arena in North Little Rock AR, Honda Center in Anaheim CA, American Airlines Center in Dallas TX, Baton Rouge River Center Arena in Baton Rouge LA, Oracle Arena in Oakland CA, Kansas Expocentre in Topeka KS, HP Pavilion in San Jose CA, Fort Worth Convention Center in Fort Worth TX, Tacoma Dome in Tacoma WA, Frank Erwin Center in Austin TX, Valley View Casino in San Diego CA, Comcast Arena at Everett in Everett WA, Rabobank Arena in Bakersfield CA, I Wireless Center in Moline IL. CheapConcertTickets.me delivers tickets to sold out concerts and events worldwide when no one else can and they do so at discounted prices. As a member of TicketNetworkDirect they can guarantee delivery of tickets on time for sporting events like NASCAR, NBA, NFL AND NHL, and for the hottest theater and concert events too. With CheapConcerttickets.me customer service is a priority, for more information email support(at)cheapconcerttickets(dot)me or visit http://www.cheapconcerttickets.me. Cheap Concert Tickets has discounted tickets for the Ringling Bros. Circus in Houston, Ringling Bros Circus Tickets in Los Angeles and Ringling Bros. Circus Tickets in Anaheim. Cheap Concert TicketsFind cheap tickets for all sports, concerts and theatre events at Cheap Concert Tickets.